A young couple goes frolicking in the woods late at night. The man leans into a nearby parked car and asks for light. We don’t see the driver, but a dark gloved hand extends a lighter from behind the camera and obliges the young lover. Ominous music plays as the couple heads to some secluded ruins and begins to make out. You don’t have to be a fan of gialli, to know what will happen next. 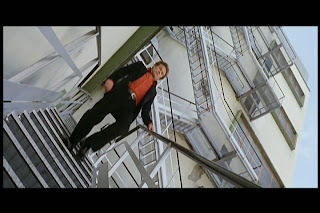 But “Spasmo” (1974), by prolific Italian director Umberto Lenzi (“Seven Blood Stained Orchids” and many others) has a quiver full of wrenches to throw into what should have been a very run of the mill film. For starters, the opening doesn’t go quite where you’d expect. As the couple starts kissing like it was going out of style, the audience notices a pair of feet dangling in midair behind them. Soon, the girl takes notice of the hanging corpse and cries out. When the man goes to investigate, he discovers that it is only a doll. As he stares in confusion, the car down by the road squeals off. This unusual prologue is enough to get a horror fan intrigued, and I settled down for an experience that I suspected would be even more bizarre than the average giallo. Unfortunately, the next hour was a little flat. Lenzi turns the early curveball into a narrative philosophy, and spends the first two thirds of the movie making things ever more confusing. 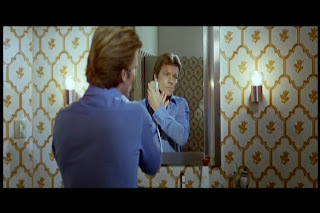 Our protagonist is a handsome 70’s beefcake named Christian Bauman. When we meet him, he is showing his girlfriend an unremarkable beachside locale where he and his brother Fritz once found a dead dog when they were young. Christian explains that since the death of their father as children, they have been very close. We later find out that Christian is also quite rich, being the co-heir of a factory in the industry of “plastics” (delivers with the same vague reverence as in “The Graduate” (1967)). His girlfriend spots the corpse of a woman on the beachside and the couple runs down for a closer look. 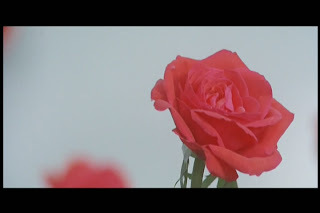 Lenzi has the audience expecting another doll (he has just used this formula before the opening credits), but instead we discover that it is indeed a real girl. She isn’t even dead, but given her level of acting talent, she might as well have been. The woman is Barbara, a mysterious blonde who claims to have fainted and is shocked to find anyone would think she was dead. Christian mentions that it must have been the power of suggestion (he had just been talking about his dead dog), but I think it was the fact that she was sprawled face down and perfectly still in the middle of a stretch of barren sand. Barbara quickly disappears, but leaves behind a clue that Christian uses to track her to a yacht party, already in full swing. The attempt to create a rich and ritzy atmosphere demonstrates a fault in the film that is already becoming obvious at this point: the sets and production values are totally underwhelming. 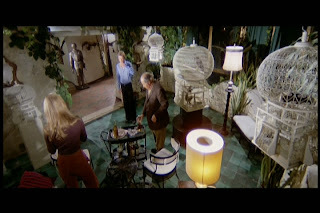 Lenzi claims to have intentionally shot much of the film during the bright daylight to buck thriller conventions, but the result is, more often than not, monotonous flat lighting and a loss of potential atmosphere. Not surprisingly, Christian bumps into Barbara once again, and meets her possessive boyfriend, Alex, who happens to be hosting the party. Despite both of them being “involved,” they leave the party together intent on a passionate tryst. The only condition is that Christian has to shave his beard. This is where things start to get really weird. While grinding down his chin, an odd looking fellow (who compulsively plays with magnetic metal balls in his left hand) jumps through the window with a silenced pistol. A tussle ensues, and Christian ends up shooting the intruder to death. He tells Barbara, (who didn’t hear the five minute long struggle from the next room presumably because of the radio) and without even looking at the body, she decides they have to run away. On the way out, they bump into Alex, whose participation in the attack is ambiguous, and he takes them to a diner where he threatens them both. Christian returns to the scene of the crime for an incriminating necklace he left behind only to discover that the body and gun are gone. He coincidently runs into Barbara at a gas station minutes later and she suggests that they hide out in the castle of her Brazilian painter friend who is away for several months. 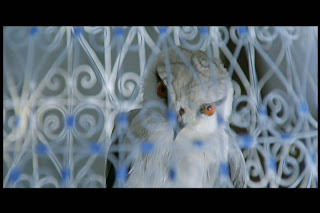 She fails to mention until a frightening introductory montage, that her friend also collects birds of prey. Within the first night alone, Christian observes a motorboat spying on him, gets stalked by the man he killed (now bearing bloody hedge clippers) and runs into the otherworldly temporary tenants during a power outage. The pair of renters are Malcolm (a reporter who covered the death of Christian’s father and the recent stabbing of yet another realistic doll at a nearby motel) and Clorinda, a beautiful redhead that Christian silently recognizes from his past and immediately seduces despite her refusal to answer any of his questions. 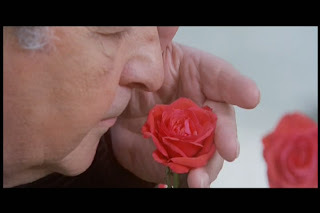 This somehow manages to be less disconcerting than Malcolm sniffing roses the next morning. Christian finds that Barbara isn’t in her room any longer and heads out to look for her. Meanwhile, the camera makes a slight digression to note the hand of a corpse jutting out of a nearby well. At about this point (say, 50 minutes into the film) it became pretty obvious that there wasn’t any way that this would all make sense. I was about half right. The story is so strewn with unexplained events, unanswered questions, unnecessary complexities, impossible coincidences, irrelevant details and elaborate hairpin turns that I have to decry it as poor writing. Even with the climactic revelation that covers about 60-70% of the strangeness, the majority of the film is a narrative mess. Except that… well… I live for this type of thing. While I acknowledge that the vast majority of audiences will find the first two thirds of the film impossibly convoluted and inaccessible, Lenzi sort of makes it work. The whole jumbled juggernaut plays like a derailed train that just keeps barreling onwards without apology or remorse. It helps that Lenzi has a killer final act up his sleeve that almost redeems the previous headache. I won’t spoil the ending, because it’s just so good it has to be experienced the way Lenzi wanted it (he rewrote the script to include it). Suffice it to say that Christian must confront his unfortunate past, acknowledge a horrifying present and embrace a tragically depressing future. One begins to appreciate why the bulk of the film played so awkwardly, since Lenzi was operating under a private set of constraints (think “Sixth Sense,” “The Game,” or the “Eye of the Beholder” Twilight Zone episode, only handled with less precision and professional care). Topping it all off is one of my all-time favorite codas. Lenzi pulls one last wrench from his wrench-quiver and chucks it into the train wreck. 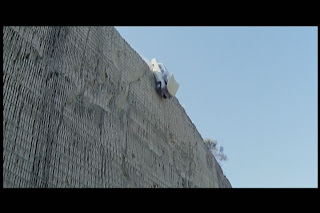 It adds yet another plot hole to the expanding chasm (involving a doctor’s note with the most incompetent “well, duh” oversight), but satisfyingly packaging up the film in a fittingly perverse and unsettling gift wrap. Overall, the film showcases some of the worst acting and dubbing that the giallo genre has to offer with a cast of across-the-board duds. The writing doesn’t help and often seems needlessly opaque and unhelpful. The daylight shooting and “meh” sets keep the visuals below average, but here too Lenzi rallies in the final third. 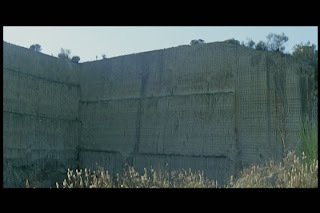 A stark rectilinear quarry and a metallic graveyard of a factory (looking like something out of the late Antonioni’s “The Red Desert” (1964)) have just the sort of existential vacuum to reflect the growing desperation and despair that Christian feels. 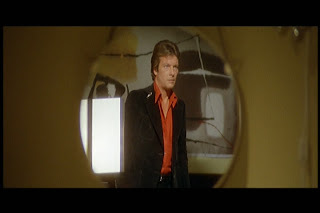 Lenzi has enough stylistic punch to prove he’s not asleep on the set and even to establish himself as a giallo trendsetter with a talent of his own. Unfortunately, he seems to bestow his craft and attention only sporadically, with enough dry stretches and dull shots to feel amateurish at times. The overuse of zoom shots and focus pulls (not between layers, but just to open or close scenes) feels hokey, even by Italian standards. Then, too, there is so much coming and going in scenes that won’t make sense until much later, that bland connective tissue and stagnant filler dominates the middle portion of the film. On the positive side, Lenzi’s choice to have “murdered” dolls peppered throughout the background of the film is a stroke of creative brilliance. It inspires shock, revulsion and curiosity in a way that adds to the film’s confusion, but also to it thematic power and uneasy atmosphere. The choice of music (another great Ennio Morricone score) with repeating downbeat strains, also contributes by mourning the inevitable tragedy long before it has even occurred. 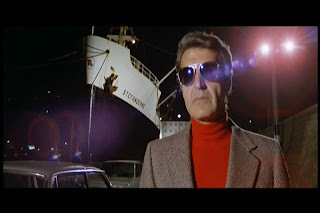 My rating reflects that “Spasmo” is a two-thirds poor-to-mediocre film and a one-third inspired thriller, but if you can tolerate (or perhaps even relish) cutting through an hour of Gordian knot, this giallo will reward heartily. Jesus CHRIST, that's a frightening dolls. The more sophisticated the doll, the more absolutely terrifying it is. That's my motto. 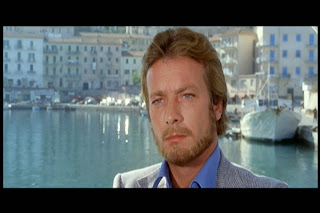 Hi Walrus,great review...I have always wanted to get a hold of this Giallo,but have never got around to it. I remember vividly the old VHS cover from years ago! I love the idea of the dolls, very creepy.